The second class of annuals includes those which are tender, that is, whose foliage cannot stand cold at any time. These should not be sown out of doors in the open ground in spring until the last danger of frost is, gone and the soil is warm and mellow. Many times in particularly favorable situations these plants will drop seeds which will live to germinate the next season, but it is not wise to rely on this for the next year’s plants. 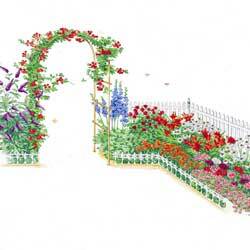 In this class come such plants as the alpiglossis, marigold, ageratum, candytuft, zinnia, and Phlox drummondi. We would include in this class all the annuals, which will succeed by sowing the seed out of door, and thinning them if they come up too thickly. The third class of annuals includes all of those, which require a long time for seed germination and a long period of growth before blooming. These annuals will give best results if the seeds are started in some protected place such as a coldframe or in the house if the conditions are right. Among these are such plants as China aster, verbena, petunia, snapdragons and scabiosa. Sowing seed. The secret of success in planting any seeds is proper soil preparation and depth of sowing, and annuals are no exception. A good rule to follow is that the finer the seeds, the finer the soil in the seedbeds should be. The soil should be as mellow as possible, and if the soil available tends to be clay, it would be best to incorporate a large amount of sand and humus in the form of well-rotted leafmold or peatmoss. Do not include manure or plant food in your seedbed. Young seedlings do not require much in the way of plant food, and it is best to reserve the use of this material for the transplant beds and the flower borders. 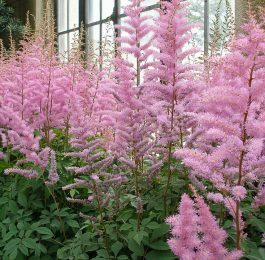 When sowing the hardy annual seed directly in the flowerbeds in the fall, it is best to broadcast the seed over the surface of the soil and lightly rake it in. For broadcasting the seeds evenly, it is best to mix it with fine dry soil or sand. The seedbed should then be lightly tamped and a thin covering of well-rotted leafmold or fine peatmoss be applied over the top to prevent excessive heaving of the soil. If we would rather wait until early spring for planting hardy annual seeds, they’re best covered with burlap, to prevent the birds from eating the seed. This same advice would hold true for sowing the third class of seeds in the beds in late spring. When covering the seedbed with burlap or cheesecloth, however, one must watch carefully for germination, and, immediately after this starts, remove the covering. It is also important to guard against drying, during germination especially, as it is fatal at this period. The annuals needing a long growing season must be sown in boxes or pots, and for this purpose one can make no better investment than to buy or construct a coldframe, which may be obtained from most greenhouse manufacturers. There are times, however, when sowing in pots is advisable. This is true in the case of tiny seeds or if one has very few seeds of some choice annual. In the case of fine seed, obtain pots, known as bulb-pans, from a florist. These are merely large, flat pots. The 8 or 9-inch size will be sufficiently large. Fill the bottom of the pot with cinders or gravel, the next third with soil screened through ordinary hardware cloth screen, and the last third with soil screened through fine window screen. Obtain a piece of copper screen for this purpose and nail it on a square framework, and it will remain serviceable for a number of years. It is best, when the pot is two-thirds full, to firm the soil and water it before adding the final third of fine soil as recommended previously. This is for better distribution. If it is very fine seed such as petunia, do not cover but merely press in with a small piece of wood. This process completed be sure to label the pot correctly. Wooden labels of appropriate size may be obtained at any seed store. Transplanting. When it is desired to grow plants in the coldframes for bloom elsewhere, it is much better to transplant the seedlings once before the final setting in their permanent places. They will thus develop better root systems, and will be much thriftier than if allowed to grow in the seedbeds until moving them outdoors. When the plants begin crowding one another, which will be when several leaves have formed, the seedlings should be dug up and transplanted in rows in the coldframe. If the seedlings grow too vigorously and begin to shoot up rapidly, it is best to pinch out the top, leaving at least two sets of leaves.